Essentials of Field Maintenance - Iowa Mold Tooling Co., Inc. : Iowa Mold Tooling Co., Inc.
A field technician’s skills are useless if they aren’t equipped with the right tools, an appropriately sized crane for the job, and the lighting they need to accomplish their round-the-clock work. Ensuring your field techs have the resources they need on their service truck is imperative to minimizing your downtime and improving operational efficiency. While every customer’s needs will be different, from the size of the crane to the tools they need on hand, here are some basic components of field maintenance that every operator should consider. On that same job site, an unexpected problem with a piece of equipment could translate to delays if the field tech isn’t prepared with the right tools. 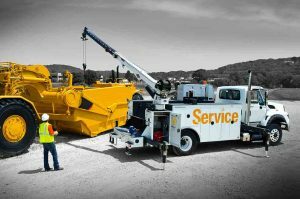 “If one of the tracks on a crawler isn’t running correctly, or a bearing goes out, the field tech needs the ability to get there quickly, have the necessary part with him, and use his service truck, his tools, and his crane to pull that bearing or that track off and replace or repair it immediately. If he’s prepared, he can get that equipment back up and running again, and the job site continues to operate,” said Wallace. Handling repairs in the field gets operators back to work faster, but more importantly, it relieves the stress and cost of finding ways to transport the sidelined equipment to and from the job site. Lube skids, like those IMT offers, are a good option for operators working on compact equipment. A more permanent solution would involve mounting a small tank with pumps in the back of the service truck. Customized sizing on extraction pumps for waste oil and waste oil storage is incredibly important to many field service technicians. “At IMT, we make sure to determine how much clean oil a customer will need, and then size the extraction pumps to fit their needs,” said Wallace. Disposing of waste oil properly is imperative, and since the waste oil storage tank is often the biggest tank on the truck, choosing the right-sized and equipped tank is paramount. “We use high volume pumps to extract the oil, because the last thing you want to do is wait while the oil is draining,” said Wallace. Taking the time to customize your lube dispenser can ensure reliability on the job site and offer innovative options for technicians as well. While air pumps are primarily used for running waste oil, hydraulic pumps are more conducive with clean oil since they offer more sensitivity to contamination and are a more robust pump. The pump nozzles can also vary greatly, from simple on/off pieces to nozzles that provide a readout while being pumped. For seamless tracking of oil use, an electronic nozzle can sync with your laptop and bill the customer for the oil and fuel in real time. Just minutes after you’re done pumping, the customer receives the invoice.